Learn to stitch Plastic Canvas at www.CraftDesigns4you.com! with this Simple Smiley Face Pattern! If you are new to Plastic Canvas, try this free "Smiley Face" pattern. It will take you step-by-step through the instructions needed to successfully complete your first plastic canvas project. Included are many helpful charts that you can print out for your own use. Plastic Canvas graphs are either in COLOR or BLACK and WHITE SYMBOLS. The following two charts for the smiley face pattern show you both versions: Color and Black and White Symbols. Each symbol or colored stitch represents one plastic canvas basic stitch, called a "continental" or "tent" stitch. These basic continental stitches are made on a diagonal from the bottom of one hole to the top of the next hole, so the stitches or symbols on the chart are shown at the intersection of the canvas, exactly how they will be stitched. The graph will have a key to tell you what color of yarn the symbols or colored stitches represent. Looking at the COLOR chart, the blue stitches are for the blue yarn, yellow stitches for the yellow yarn, and black stitches for the black yarn. Looking at the BLACK and WHITE SYMBOL chart, the thin diagonal lines are for the blue yarn, the open ovals are for the yellow yarn, and the solid ovals are for the black yarn. Plastic Canvas is available in different colors and in different sized holes called "COUNTS". 7-count plastic canvas is the most popular. The count refers to how many squares/holes there are in the canvas per inch - thus 7-count means there are 7 squares per inch. Other plastic canvas counts are 10-count, 14-count and 5-count. You can stitch a plastic canvas pattern on any count of canvas that you want - just keep in mind that you will need to figure out the final dimensions based on which size canvas you stitch on. Plastic canvas also comes in a wide variety of colors which can be used to create fun projects without having to stitch the whole canvas. Click here for an example of this with our Alphabet Blocks pattern. Colored canvas is widely available in 7-count. You can find some colors in 10-count also, but 5-count is available in clear only. 14-count can be found in clear, black and white. Plastic Canvas is available in rectangular sheets. There are also some pre-cut shapes available. These are in 7-count only. Some examples of these pre-cut shapes are squares, stars, circles, triangles, ovals for placemats, and individual shapes such as crosses, flowers, cats, etc. The clear plastic canvas in 7-count also has different "thicknesses". There is "regular", "soft" and "stiff". Regular is the normal type to stitch on, soft can be used when your project will be curved or bent - such as for a basket handle - so that it won't break. Stiff is good for projects that need to be extra firm to stand alone or for the backing of a picture. The most popular size of plastic canvas, 7-count, uses regular 4-ply worsted weight yarn. Red Heart by Coats and Clark has a very large selection of colors to choose from. Some other popular choices are yarns that are made specifically for plastic canvas stitching, such as Needloft yarn by Uniek and Plastic Canvas yarn by J&P Coats. There are also specialty cords in fun metallics and pearlized sheens to use on 7-count plastic canvas by manufacturers such as Darice and Uniek. You will find these in the plastic canvas section of your local craft store or even Walmart. 5-count plastic canvas, which is a the largest count, can be stitched with 2 strands of 4-ply worsted weight yarn. There are some thicker yarns, such as "Grande" by Red Heart that can be used as a single strand of yarn to stitch with. Also, Craft Designs for You has developed some fun projects using Chenille Stems (pipe cleaners) for a fun look on 5-count plastic canvas. Click here for a FREE Ladybug Magnet pattern using 5-count plastic canvas and chenille stems. 10-count plastic canvas, which is smaller than 7-count, can be stitched with 3-ply sport weight yarns, such as Red Heart brand by Coats and Clark. DMC's #3 Perle Cotton also works nicely, and you can also use 12-plies of DMC Floss. DMC Floss has a large range of colors to choose from. 14-count plastic canvas, which is the smallest count, can be stitched with 6-plies of regular DMC Floss or DMC #5 Perle Cotton. With plastic canvas, it's best to cut the size that you need before you start stitching your project. For patterns that are flat pictures - like our smiley face pattern - you will see the dimensions in the instructions, in this case 18 holes wide x 18 holes high. Plastic canvas is usually marked with a slightly thicker line ever 10-squares to make it easier to count. So you would count out 18 holes, and then cut the canvas at the outside edge of the bar that is right past the 18th hole. Do this for the width and the height. Cut your canvas neatly and trim off any corners that poke out, to prevent your yarn from snagging on the edges while you stitch. Many plastic canvas projects have complex shapes, such as a shape of a teddy bear - where the canvas will resemble the finished shape of the piece. You will need to count carefully to make sure that you cut out your canvas shape accurately. You can use a water-based marker, such as those used on over-head projectors and white boards, to mark the shape on the canvas before cutting it out. When you are done cutting it out, run your canvas under some water, to completely remove the marker before stitching. Plastic Canvas is stitched with yarn and a tapestry needle (which has a round end instead of a sharp one). The most popular size of plastic canvas is 7-count which means there are 7 holes per inch. 7-count is stitched with 4-ply worsted weight yarn and a size #16 tapestry needle. Plastic Canvas is made of Holes (the white part) and the Grid or Bars (the gray part). You stitch in the holes over the bars. Most patterns state the size of the design by the number of holes. This grid is 4 holes wide by 3 holes high. The main type of stitch used in Plastic Canvas is called the Continental or Tent Stitch. Notice the diagonal direction from bottom left to top right. When starting your stitches, do not knot the tail end, but hold an inch or two of that tail end on the back of your canvas. As you work, stitch OVER the tail end on the back side of your canvas. Trim any extra length of the tail on the back after you have covered it with several stitches. When you have finished with your yarn, weave the other end behind your stitches on the back of your canvas. You can also start your next piece of yarn in this way, by weaving it under a few stitches on the back. This picture shows the order for making the Continental Stitches. You bring your needle and thread UP through the hole to start at 1 and DOWN through the hole at 2. Continue making stitches in the order of the numbers coming UP at the odd numbers and going DOWN at the even numbers. When you are done with your stitches, weave your yarn through the backs of your stitches and cut the yarn. Notice that the bottom right hole and top left hole are not used. There are a lot of fun stitches you can make on plastic canvas. Longstitches are made like Continental Stitches, but are worked over more squares. The amount of stitches may vary according to the instructions, but they are all stitched in the same way. In this example, you bring your needle and thread UP through the hole to start at 1 and DOWN through the hole at 2, UP at 3, DOWN at 4, and so on. In this photo, you see the eye of the horse is made with a cross stitch. Cross Stitches in Plastic Canvas are made just like you would make them on Cross Stitch fabric. Cross Stitches are made like the continental stitches - the top one is in reverse - follow the order as shown. Backstitches are used to outline, make words, or add details. Overcasting stitches finish the outer edges of your picture. Whipstitches join pieces together to create dimentional objects such as tissue box covers. Plastic Canvas can be used for a variety of fun and creative projects! Backstitches, like this letter, "C", are made AFTER ALL continental stitches are completed. Backstitches can be stitched horizontally, vertically and diagonally. The instructions may call for using the same type of yarn as the rest of the stitches. As in this example, both the continental and backstitches are made with 4-ply yarn. Backstitches may also be stitched with thinner yarn, such as 2-ply yarn or even DMC Floss or Perle Cotton. When making backstitches, follow the order shown in this chart: you bring your needle and thread UP through the hole to start at 1 and DOWN through the hole at 2, UP at 3, DOWN at 4, and so on. When you have finished all the stitches in your pattern, you will then stitch around the outside edges of your canvas, making Overcast stitches. Put one stitch in each hole along the straight edges and 2 or 3 stitches in each corner hole to fully cover over the plastic canvas. The instructions in a pattern may say to "overcast in matching colors". This means you will choose the yarn color(s) that match the color of the nearest stitches to the edge. Follow the order as shown. 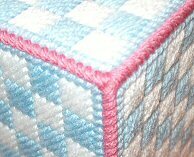 In this photo, you see the corners of a tissue box cover, whipstitched together in Pink yarn. Whipstitching is used to join the edges of 2 or more pieces of plastic canvas together, and is done the same way as Overcast stitching. Since the French Knot is a popular stitch, used in Cross Stitch, Plastic Canvas, Embroidery, even in embellishing Crochet and Knitting projects, let's learn how to make one! Bring your needle and yarn up through the space/hole where your French Knot will be made. Wrap the yarn around the needle close to the tip of your needle. With the index finger of your right hand, hold the yarn wrapped around the needle in place, so that it doesn't slip off the needle. With your left hand, hold the rest of the yarn firmly to one side, about 1 inch from the needle, and insert your needle back down into the same space/hole. With your left hand, continue to hold the yarn firmly to the side, as you pull the needle and yarn SLOWLY through the back of your work. Hold the yarn firmly but not too tightly. If you pull too hard, your French Knot may end up too small. Remember to pull the yarn slowly through the back, or else you may pull the whole knot through the hole. When the yarn is pulled almost all the way through the back, let go of the yarn with your left hand, and slowly and gently finish pulling the yarn all the way through to the back. The result is a nice, round French Knot! Visit our Shops for fun and easy Plastic Canvas Patterns!